A U.S. taxpayer-funded school in northern Virginia received more than $6 million from the Defense Department despite being investigated for alleged ties to China’s military, Fox News reported. UMT academic dean J. Davidson Frame salutes as his wife, UMT president Yanping Chen Frame, holds a Chinese military uniform. But, “there is another side to the school’s leadership that drew the attention of the FBI, the Justice Department, the Pentagon, Immigration and Customs Enforcement, and the Naval Criminal Investigative Service (NCIS) since at least 2012 – and perhaps as early as 2009,” a Fox News investigation revealed. Multiple federal investigations have looked into the university leadership’s alleged ties to the Chinese military and whether thousands of records from U.S. service members were compromised, the report by Fox chief intelligence correspondent Catherine Herridge said. “In December 2012, the FBI made two very public raids of UMT and the northern Virginia home of university president Yanping Chen Frame and its academic dean, her husband J. Davidson Frame. Documents reviewed by Fox News show it was a counter-intelligence case, known as a ‘200d,’ one of the most highly sensitive categories for a federal probe,” the report said. Photos, exclusively obtained by Fox News, appear to show Chen as a young officer in the People’s Liberation Army. 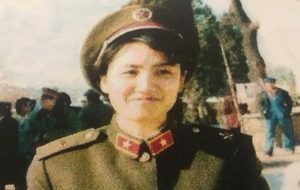 Another photo shows Frame saluting his wife, Chen, who is holding a uniform. 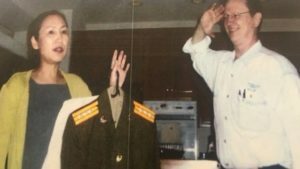 Three independent experts told Fox News it was a Chinese military colonel’s uniform. Since the FBI raids in 2012, UMT has collected millions of dollars from the Defense Department for tuition assistance programs as well as the Department of Veterans Affairs through the post-9/11 GI bill. Rhoads said he worked at UMT recruiting veterans when the FBI approached him in 2012 regarding the federal investigation. Emails and other documents reviewed by Fox News corroborate key elements of Rhoads’ story. Rhoads said Chen had a particular interest in Ohio’s Wright-Patterson Air Force Base, which is a research and technology hub. Undated photo appears to show Yanping Chen Frame before she came to a U.S. graduate school. Rhoads says Chen was upfront about serving in the Chinese military, but hid those ties on immigration applications. Fox News reviewed Chen’s immigration records where she consistently denied ties to the Chinese or any foreign military. When asked, “Have you ever been a member of, or in any way affiliated with, the communist party or any other totalitarian regime?” Chen checked “no.” She would later become a naturalized U.S. citizen. While there are no U.S. laws preventing a naturalized citizen from running a school like UMT, the Fox News investigation found that Chen’s ties to the Chinese military appear to run deep. Three outside experts consulted by Fox News confirmed the authenticity of the Chinese uniforms in the photos of Chen and Frame. “If somebody was wearing that uniform, I would say that there’s a very great likelihood that they were in the People’s Liberation Army,” Dennis Blasko, a leading Chinese military expert said, referring to the photo of what appears to be Chen in uniform. No charges have been filed in connection with the investigations into UMT.